It's time for spotted spurge (Chamaesyce maculata) to make its appearance in a landscape near you. This warm-season annual member of the spurge family (Euphorbiaceae) typically appears midseason when soil temperatures are warm enough for germination (60° to 65°F). As soil temperatures climb to more than 90°F, germination can continue provided adequate moisture is available. Spotted spurge develops a central shallow taproot from which prostrate, reddish stems form a flat, extensively branched mat up to 2 feet in diameter. The taproot allows spurge to be pulled easily from the soil. However, the stems exude milky sap when broken and sticky fingers often result. 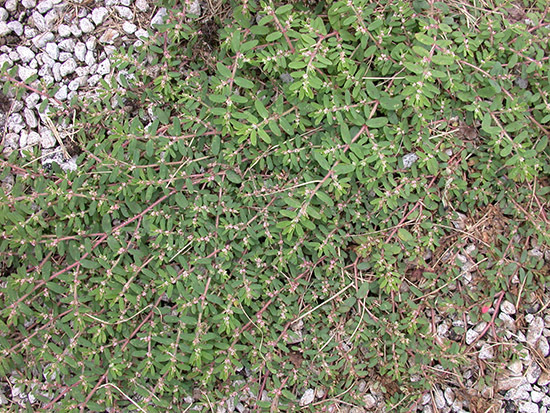 Leaves of prostrate spurge are opposite, small, oval, and up to 3/5 inch long. Leaves are pale green and sometimes have one purple spot each – hence the name. The leaves can be hairy. The petioles are short. Spotted spurge flowers are very small, inconspicuous, cup-shaped, and develop in terminal clusters or leaf axils from June to October. Spotted spurge is found in landscape beds, sidewalk cracks, gardens, waste areas, and poor, drought-stressed open turf that is perhaps closely mowed. It reproduces by seeds. It germinates and grows well during hot, dry weather on sandy soils. It can tolerate shade but prefers full sun. Prostrate spurge is very similar to spotted spurge and considered by some taxonomists to be the same species.